I have been travelling, and have been struggling to write lately as I have so much to share with you all. Finally, I managed this one! I have more exciting experiences to share, so make sure you follow me on my instagram : @creativitywithkay to get a sneak peak of what's to come! I have been seeing the opening soon board for Morelli's Gelato in Doha for a while now. To find out exactly what was to come, I decided to try it out when I came to Dubai. It's already summer, and the temperatures are soaring high that ice creams and gelatos, and staying inside air conditioned places are much needed relief to cool down in the heat. 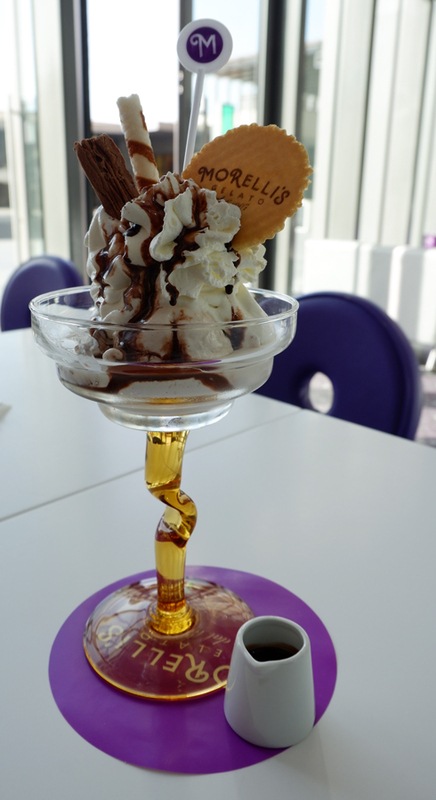 There are more than two branches of Morelli's gelato in Dubai, and the one we went to was located on the walk at JBR. I particularly like the place to go on a leisurely walk. As much as the weather wasn't that friendly for walks during the day, the night times were much better. There is always lots to do in Dubai that relaxing isn't much of a choice for me when I am there. Also, I really cannot stand the heat because it gives me a headache. I was in Dubai as I was attending the Arabian Travel Market, and in between talks, seminars, and meetings, I decided to cool it off that day with a gelato. It was quite hot! It's 3 in the afternoon, I didn't expect it to be cool either. Ice creams are more fun, and fulfilling when it's summer. We went there sometime around 3:00 pm, found the closest parking lot, and ran into the ice cream store. It's not a very big store but enough to seat around 15-20 people at a time. There's enough sunlight coming in - just to make sure you get those good gelato shots, and enough to light the room. The little store has a lot of beautiful details in the little space that it stands in. More than everything what I really liked about the place was the friendly staff. Friendly staff somehow is always a winner for me. We were asked to choose our seats first, and after offered us water. Yes, it was needed! We then flipped through the menu over, and over having no idea what to choose. One of the staff took us over to the counter where they had all the different gelato flavours as it was our first time there, and we had no idea what flavours they had, and what most of them tasted like. We went over to the counter, and tried different flavors. My favorites from the lot were Ferrero Rocher, and Coconut Gelato. I asked that they be part of whichever sundae I was ordering, and the staff were happy to accomodate my request. We ended up ordering Hot Fudge Sundae which was my order. I opted to pair it with Morelli's cappuccino as that's how much of a sweet tooth I can normally accomodate. Mr. M chose Pistachio Delight, and also ordered a smoothie on the side. I must say I loved his order better, and this huge serving of Sundae was emptied in no time. Mr. M has quite a sweet tooth. 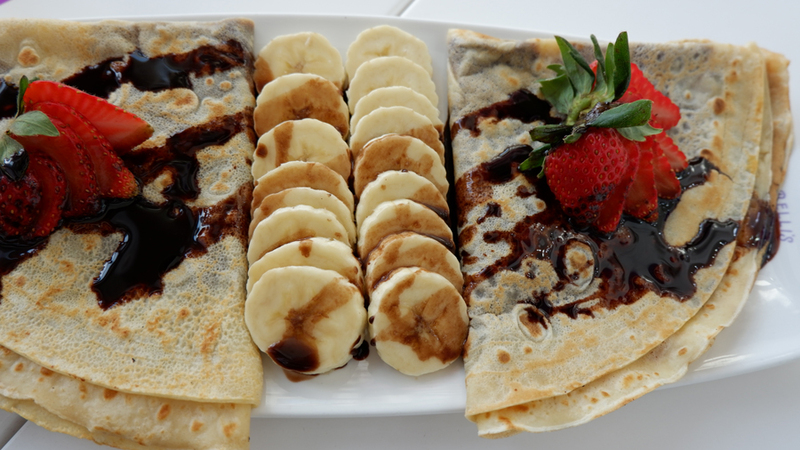 I can never resist a good crepe. The crepe was more on the okay side for me. However, they had such a generous serving of fresh fruits on top that I was really happy I had made the order. I was literally craving for a bit of healthy after all that sugar overdose. I mean slightly healthy because there isn't anything healthy about it except the fruits! For myself, if I were to go back I would try another sundae as the one I ordered wasn't my fave. I loved Mr. M's order more. The order size was massive. So, if you don't go hungry, you may not be able to finish the sundae by yourself especially the ones we ordered. I would definitely love to work in this cafe on a hot summer day - it's a very chic and nice place, and you get your ice creams really good looking! So what do I recommend from here? I would definitely say the Pistachio delight, else if you have taste buds like mine. Go for the individual gelato flavors, I enjoyed them better! Have you tried the place? Would you go? Disclaimer: This post was done in collaboration with Morelli's Gelato. However, all pictures, and opinions are my own!